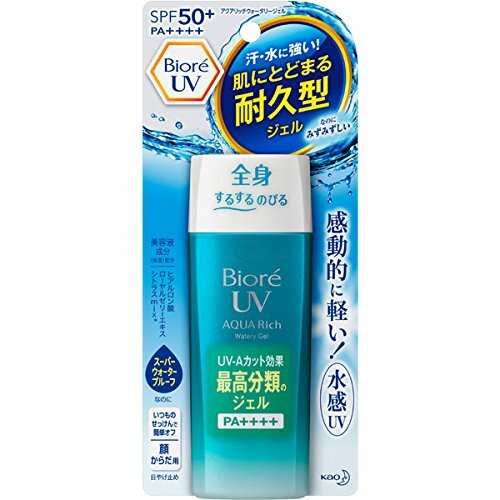 Super water proof sunscreen / SPF50+ PA++++ / For face and body /Moisturizing ingredients: Hyaluronic acid, royal jelly extract, citrus mix / Allergy tested (Formulated to minimize the risk of allergy) / Contents:90g / Made in Japan The ingredients is below : Water, ethanol, ethylhexyl methoxycinnamate, (lauryl methacrylate / methacrylic acid Na) crosspolymer, alkyl benzoate (C12-15), bis-ethylhexyloxyphenol methoxyphenyl triazine, diethylamino hydroxybenzoyl hexyl benzoate, dimethicone, ethylhexyl triazone dimethylsilyl silica, DPG, xylitol, dextrin palmitate, (acrylates / alkyl acrylate (C10-30)) crosspolymer, (dimethicone / vinyl dimethicone) crosspolymer, polysilicone-9, glyceryl stearate, AMP, ( vinyl dimethicone / methicone silsesquioxane) crosspolymer, agar, isoceteth -20, alkyl (C30-45) methicone, polyvinyl alcohol, olefin (C30-45), hydroxide Na BG, PG, hyaluronic acid Na, royal jelly, orange fruit extract, grapefruit fruit extract, lemon fruit extract, phenoxyethanol, EDTA-2Na, BHT, Fragrance. If you have any questions about this product by Bioré, contact us by completing and submitting the form below. If you are looking for a specif part number, please include it with your message.